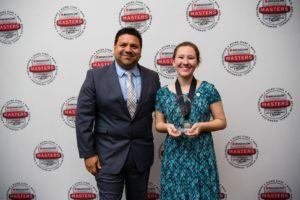 The Lemelson Foundation has pledged a $10,000 award for the Broadcom MASTERS the finalist who creates promising solutions to real-world problems. The Lemelson Award for Invention will be one of the top prizes presented in Washington DC at the Broadcom MASTERS, the nation’s premier middle school STEM competition. The Lemelson Foundation uses the power of invention to improve lives, by inspiring and enabling the next generation of inventors and invention-based enterprises to promote economic growth in the US and social and economic progress for the poor. Helen Lyons won the 2017 Lemelson Award for Invention. Through her project, Helen investigated a renewable energy technology, specifically generating electricity using Faraday’s law of electromagnetic induction. We have reached a critical juncture for STEM education as set forth in the report by the National Science & Technology Council. The report offers several interesting road maps, but without national funding to back them up, Paula Golden makes the case that we cannot turn the tide in educating a STEM-literate society. The article focuses on the opportunity to change the course in STEM education as a result of the dramatic increase of scientists and women in the next Congress. Please read and share far and wide as we think ahead to important STEM initiatives in the new year. Please read a Q&A on PC Magazine with Paula Golden and Henry Samueli from the Broadcom Foundation. Opening the Door for Future Leaders in STEM! From computer forensics labs and medical simulations to the great outdoors, Girl Scouts of Orange County is delivering mind-blowing STEM experiences to young women who may not have realized that science, technology, engineering and math impact almost everything they do in their daily lives. Through the My STEM Life Badge, one of the first STEM badges in the nation, Girl Scouts of Orange County is opening the door to a multitude of exciting careers. Saachi, a 9th grader from Girl Scout Senior Troop 990 in Irvine, completed her My STEM Life badge in July, which included a visit to the Kaiser Simulation Lab where female doctors demonstrated emergency room scenarios. She discovered how every element of STEM is involved in the daily activity of saving lives. “Originally, I thought only science and technology were necessary for doctors to save a patient’s life, but now I realize that the engineering of equipment and the mathematics behind procedures are also integral in the ER,” said Saachi. In the spring of 2018, Broadcom Foundation continued its renowned University Student Research Workshops to delve deep into smart manufacturing in the era of Industry 4.0 or the Fourth Industrial Revolution. As machines become increasingly automated, energy use is on the rise, requiring critical thinking and collaboration about sustaining the global economy, the environment and quality of life. The 2018 Asia Pacific Student University Workshop is an international, interdisciplinary convening of graduate students from the University of California, Irvine, CA, the National Chiao Tung University, Taiwan, and the University of Hong Kong, China. 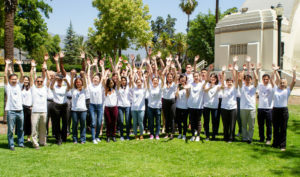 The Workshop included 22 student participants of diverse academic backgrounds and skills and guest speakers and judges from industry, including NASA’s Jet Propulsion Lab (JPL), Syntiant Corporation and OCTANE. 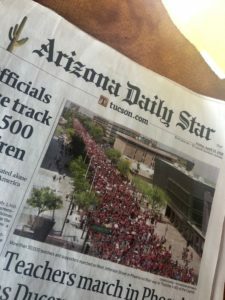 Arriving in Tucson last month, my car passed a sea of red-shirted teachers protesting in solidarity with over 50,000 educators who marched out of their classrooms to the Phoenix statehouse to demand more funding for public schools. Teachers in Arizona and Colorado joined ranks with colleagues from states like West Virginia, Oklahoma and Kentucky – with more to come. To our everlasting national shame, the United States is eating its own seed corn. Breakthroughs in science and engineering don’t happen in a vacuum… but when multi-cultural and cross-disciplinary brainpower combines in one room to tackle big ideas, it moves mountains! That is the vision behind the Broadcom Foundation University Student Workshops. The KKT Workshop – now in its 16th year – is proof of concept, and the inaugural EMEA Workshop in 2017 and upcoming 2018 Asia Pacific Student Workshop reflect the foundation’s commitment to innovation through international collaboration. As a Boomer, I grew up believing that a level playing field was all we needed for women to succeed in their chosen fields. The #MeToo movement has radically changed my thinking, so I am adding my voice to the chorus of millennial women who say there needs to be a fundamental cultural shift in the American Workplace.